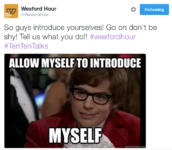 You might have heard the term Twitter Chat or Hour and are wondering what it’s all about. We’ve written a short guide to help you get started. Why would you join a Twitter Chat? Well why would you go to a networking event? A Twitter Chat can offer the same opportunities; to make connections, interact with others, the chance to ask for and offer advice and of course to promote your business. Remember just because you are online doesn’t mean all common curtesy goes out the ‘Windows’. Be sure to introduce yourself and be polite. Don’t only tweet about your business. Interact with the other Tweeters and join in conversations. Generally a topic is decided upon by the Host. They then let the participants know what the discussion will be. Sometimes it could just be a general chat about the local area or there could be a specific business sponsoring. If thats the case each tweet will have two hashtags, the Twitter Chat hashtag and the sponsoring businesses. Yes. Regardless of where you’re from you can join in on any Twitter Chat. 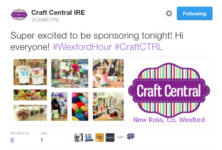 If you live in Cork and would like more customers on Dublin you can join in on #DublinHour. If you live in Wexford and you’re planning on going to Galway for a holiday then join in on #GalwayHour and ask for the best places to stay/eat/drink. What are the best Twitter Chats and when are they on?